Chicago— At noon on Tuesday, February 26th, the Graduate Employees’ Organization, a labor union representing graduate student employees at UIC, called their members to action. 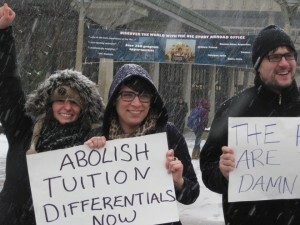 Graduate employees, faculty, students and community supporters showed their solidarity- amidst blistering winds and snow blown faces- and demanded that the University present their graduate employees with a fair contract. 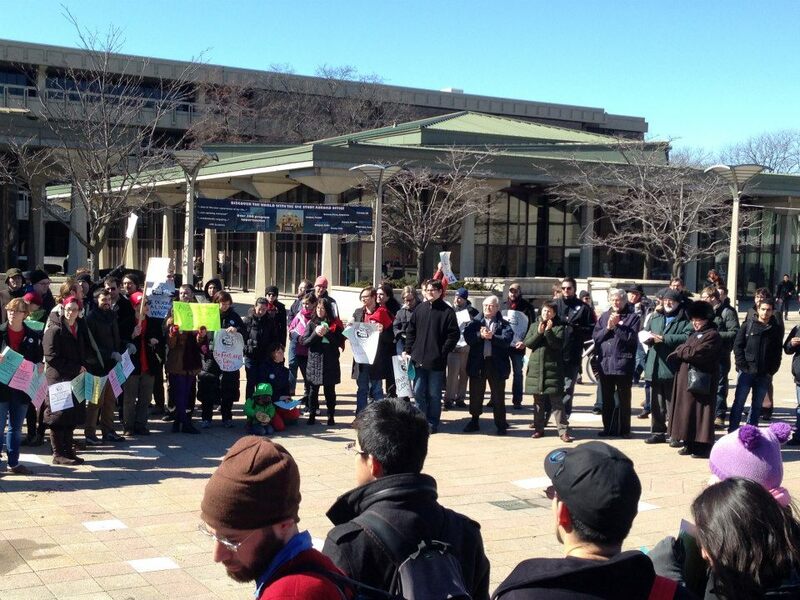 At noon, more than seventy supporters gathered to protest the University unfair treatment of their graduate employees. Currently, graduate employees are earning 140% above the federal poverty line, which economically situates them between “very poor” and “poor”. UIC administration respects us and we respect each other. We deserve better wages and we deserve to be able to afford to pay our tuition. A lot of undergraduates aren’t able to pay their tuition here and we’re not either,” said Piere Washington a teaching assistant in the Sociology Department. 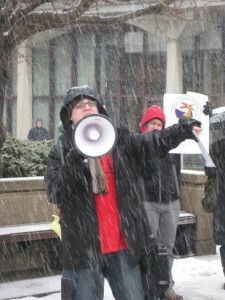 The primary points of contention include high healthcare premiums, low wages, and increasing fees.The health insurance option that the university offers its graduate employees, for a fee, is not a licensed insurance company and thus its policy holders are not afforded the same protections and rights under Illinois law as licensed insurance holders. Karen Cralli, a Teaching Assistant in the Department of Hispanic and Italian Studies was forced by UIC’s unlicensed insurance company, Campus Care, to make a choice: massive medical debt or death. “Campus Care does not cover the majority of medically necessary, life-sustaining treatment for my blood disorder. When Campus Care put me in a position to choose between death and debt, I chose debt. No one should ever be forced to make that choice… Graduate employees deserve the same choices as other UIC employees—we should have the option to enroll in an insurance plan that won’t force us to choose between debt and death,” says Cralli. 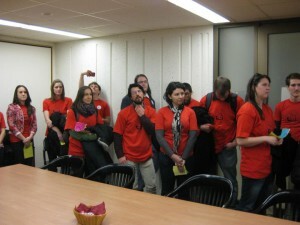 Thursday, March 7th for an all-day bargaining session. 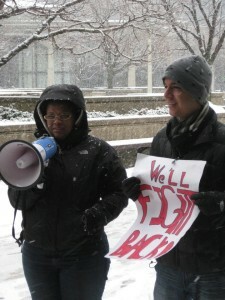 Chicago— At noon on Tuesday, February 26th, the Graduate Employees’ Organization, a labor union representing graduate student employees at UIC, will be rallying in the UIC Quad urging the administration to be more reasonable at the bargaining table. 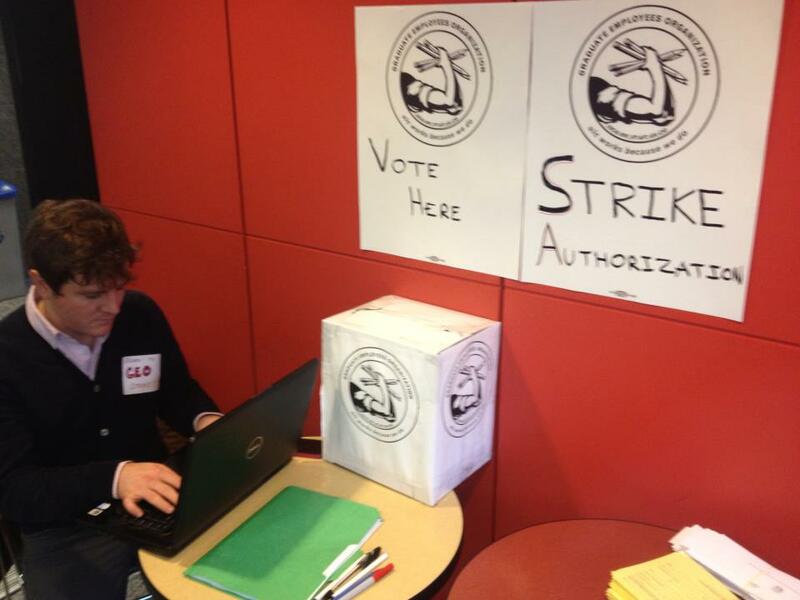 Graduate employees have been without a contract for the past six months and this has resulted in a wage freeze for their approximately 1,500 members. The primary points of contention include high healthcare premiums, low wages, and increasing fees. 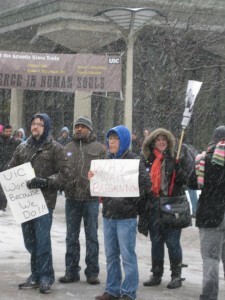 Graduate employees have demanded that their compensation match UIC’s own figure of the annual cost of living, $17,958, and the administration’s proposals have thus far fallen more than three thousand dollars below this figure. “Rally for Graduate Employee Rights” will continue the momentum from the graduate employees’ previous event, “Show Us Some Love UIC” where graduate employees delivered hundreds of Valentine’s Day messages to the chancellor in the effort to get the Administration to be more reasonable at the bargaining table.